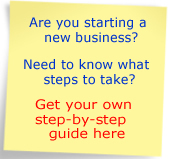 Business Development Centre provides services to Register a Business in Ontario. Registration for small business Ontario is available for Sole Proprietorships, Partnerships and Trade Name Registrations. Receive your Master Business License on registering your Small Business in Ontario. This license is valid for 5 years after which you can choose to renew it. When you register your business in Ontario, you will also need to register with the tax department. You may be required to apply for HST/GST, payroll tax numbers (if you have employees), Import/Export tax numbers and a WSIB Registration. Choose a business type suitable to your requirements. Register a business in Ontario in 3 simple steps.